Die Herzogthumer Anhalt Dessau, Cothen u. Bernburg. 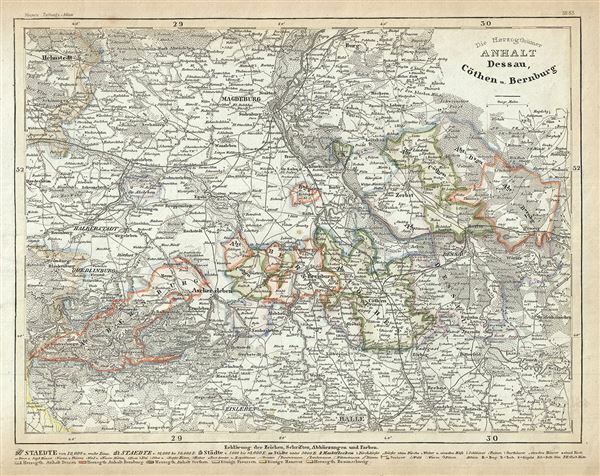 This is a fine 1852 map of the Duchies of Anhalt-Dessau, Anhalt-Kothen and Anhalt-Bernburg, Germany. It covers the former duchies and vicinity from Helmstedt to Halle and from Guntersberge east as far as Grafenhainichen. Throughout the map identifies various cities, towns, rivers and an assortment of additional topographical details. The duchies of Anhalt-Dessau, Anhalt-Kothen and Anhalt-Bernburg were principalities of the Holy Roman Empire until they were raised to become Duchies in 1807, 1806 and 1803 respectively. Following the death of the Dukes of Anhalt-Kothen in 1847 and later the death of Duke of Anhalt-Bernburg in 1863, all the Anhalt regions were united as the new Duchy of Anhalt. The region is part of the modern day German state of Saxony-Anhalt. This map was issued as plate no. 83 in Meyer's Zeitung Atlas. Although all the maps in this atlas are not individually dated, the title page and maps were often updated while the imprint with the date was not, causing confusion to the exact date for some of the maps. Moreover some maps in the atlas were taped in at a later date as an update to the atlas. We have dated the maps in this collection to the best of our ability.